Reedsport is a small town on the Oregon Coast, located at the point where the Umpqua River flows into the Pacific. Reedsport is nicely situated in the midst of the famous Oregon Dunes National Recreation Area. These features combine to make Reedsport a scenic and fun place to visit and an access point to a broad range of outdoor recreation. Here are my picks for fun things to do in Reedsport, Oregon. Reedsport's Umpqua Discovery Center is a little tricky to find but well worth a visit. The museum has two wings -- one devoted to the natural history of the region, the other devoted to the human history. All of the exhibits are well designed to appeal to both children and adults. The natural history section is a simulated hike called "Pathways To Discovery - Exploring Tidewater Country." The walls along the way are covered in exquisitely detailed murals containing the flora and fauna that call the area home. Interpretive signs, exhibits, drawers, and recordings are scattered along the route, filling you in on the local critters and landscape. Be sure to spend some time in the theatre "cave" to view one of the short films. The other section inside of the Umpqua Discovery Center is called "Tidewaters & Time." You'll take a walk through time, learning about the local human history and culture through a variety of sights and sounds. The Coastal Indian Tribes, early explorers, pioneers, loggers, fishermen, and early settlement are all covered. The center of the Umpqua Discovery Center contains a well-stocked gift shop that includes books, nautical items, gift items, and learning toys. The museum sits along the Umpqua River. Decks and boardwalks behind the center allow you to enjoy great views of Reedsport's bridges and estuarine environment. Take the stairs up to the viewing tower to extend your view. The charming Umpqua Lighthouse lies within a working U.S. Coast Guard facility and can be visited on a scheduled tour. Nearby you'll find the Coastal Visitor Center & Museum, located in the old Coast Guard Administration Building. The visitor center houses many interesting exhibits and artifacts related to the history of Coast Guard activities in the area. Umpqua Lighthouse State Park visitors can also enjoy camping, walking trails, whale watching, and picnicking. 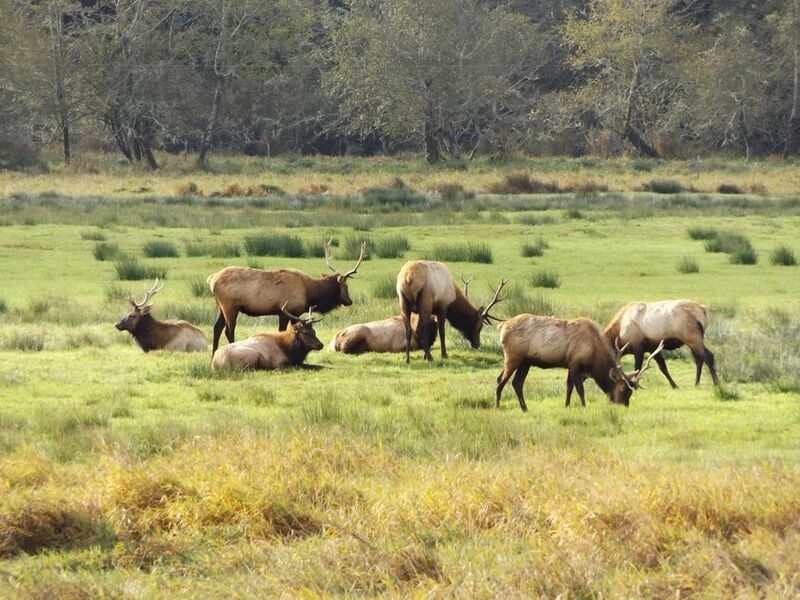 You'll head east out of Reedsport on Highway 38 to get to the Dean Creek Elk Viewing Area, home of a resident herd of magnificent Roosevelt elk. The viewing area stretches along a 3-mile section of Oregon Highway 38, with two viewing areas and several observation pull-outs. The Dean Creek Elk outdoor interpretive exhibits allow you to learn more about the elk, as well as other local flora and fauna. Another BLM-operated recreation site, the O.H. Hinsdale Rhododendron Garden, is located on the other side of Highway 38. Staffed by expert park rangers, the official visitor center for the Oregon Dunes National Recreation Area is located right along Highway 101 in Reedsport. You'll be able to find out anything and everything you want to know about Oregon Dunes activities, as well as other local recreation and attractions. The Oregon Dunes NRA Visitor Center also has a few interpretive exhibits and a small bookstore.